The Grant HS team 1508 competed in the Vex Gateway regional at GHCHS on Nov 19th. They placed 2nd but had trouble in the early rounds because of drive train stalling. 599 teams with similar drive trains were having the same problem. This was corrected by cutting the Arcade gains in half for the turn channel and multiplying the forward-aft channel inputs by a factor of 2/3. A turbo button on the stick was used to restore the gains to unity. The drive train on this robot is typical of several 599 robots and copied by 1508 with their permission. It has two 4 in omni wheels in the front and two 4 in traction wheels in the back. The wheels are cantilevered and are located on axles that have two bearing blocks holding them that are spaced around 1 in apart. The width spacing between wheel centers on any given axle is about 16.5 inches and the length spacing between axles is 8 inches. We also know that the friction of the drive train is very small. A big 393 motor geared for 160 RPM direct drives the rear wheel and a small 100 RPM motor drives the same wheel through a gearing of 5/3 to match the big motor speed pretty closely. The front omni’s are also driven by coupling gear train to the rear wheel. The motors are stalling because of too much current draw tripping the PTC 4 amp fuse in the Cortex. The question is why? Each half of the Cortex drives one big motor and a power expander is used to drive the other two small motors. This is the best one can do to distribute the load between the three power supply PTC fuses involved. All the PTC fuses are 4 amp rated and are easily tripped when the big motors stall since they alone can draw 4 amps. If the driver is actively jerking the stick back and forth then the processor could see between 4 and 8 amps on a single PTC from a big motor. This occurs when you are moving forward with a high-speed and then cause a reversal command to the motor for fast braking. The drivers were warned about this and even with smoother driving the motors were still stalling. It is my theory that the main reason for Cortex PTC blowing is a stall of one drive rail during turning. This is a phenomenon that I have noticed with many robots that are driven with the same type of drive set up including our FRC robots. It has always baffled me because simple torque models don’t predict this type of behaviour. Suppose you give a pure spin left command from the stick. What we notice is that the left drive train (the one on the inside of the turn) seems to stop while the outer drive train keeps the turn going. We would expect the center of turn to be near midway between the rear wheels but instead it seems to be more about the left rear wheel. This is not always the case but it happens frequently probably when the left and right drive train powers are not evenly matched. The only reason one side rail can stall is because of excess torque loads. We know the motors have enough torque to overcome the side friction forces opposing the turn. This can be calculated easily from the robot geometry and known or estimated coefficients of friction plus the known Normal forces on the wheels. SO… there must be an additional drag on an axle caused by a twisting torque from the stalled rear wheel that is digging into the soft tile as it turns OR the wheel is rubbing on the chassis during the turn. Where else? The drag torque must be on the order of 3/5*(13.6 + 6.5) or about 12 in lbs less the torque drag of the drive train gears and axles. Lets say the net is conservatively around 9 in lbs of torque. It is hard to imagine a drag of this magnitude coming from extra side forces on the axle caused by a twisting torque from the wheel but maybe so…. Additional testing is required to verify that the wheels are not rubbing on the chassis and to take a more careful look at the center of turn under various turn scenarios. Anyone reading this…please chime in if you have some idea of what is happening. Did a few turning tests to check the center of turn. With lots of torque the turn center was near the center of the robot between the rear wheels. As the torque was lowered one rail did stall and the turn center shifted to the inside wheel. So I think my theory is only partially correct. When low torque turns are made, one rail will stall and cause PTC heating. I will do some more experimenting when I get a chance. As you can see the wheels on this drive train are cantilevered which many would never do. We have had a lot of success with this configuration. We pay some penalty in friction loads since with this geometry I estimate that the Normal loads on the axles are increased by a factor of 2… hence also the axle drag. But we make the trade-off to gain extra 2 inches in width for tipping stability and simple gearing. We have compared unloaded drive train friction with and without chain drive. Direct gear coupling won out. As I mentioned above, it also allows us to direct drive with a 393 160 rpm motor on the rear wheel. A 100 rpm motor is mounted adjacent driving a 60 tooth gear that in turn drives a 36 tooth gear on the same shaft as the 393 motor. This provides a close balance between two different geared motors. If the wheels are not cantilevered then the 36 and 60 tooth gear spacing cannot be put on axles along the rail since they will interfere with the tires and you would probably have to revert to using chain and having the motors offset from the rail which will probably also raise the cg. 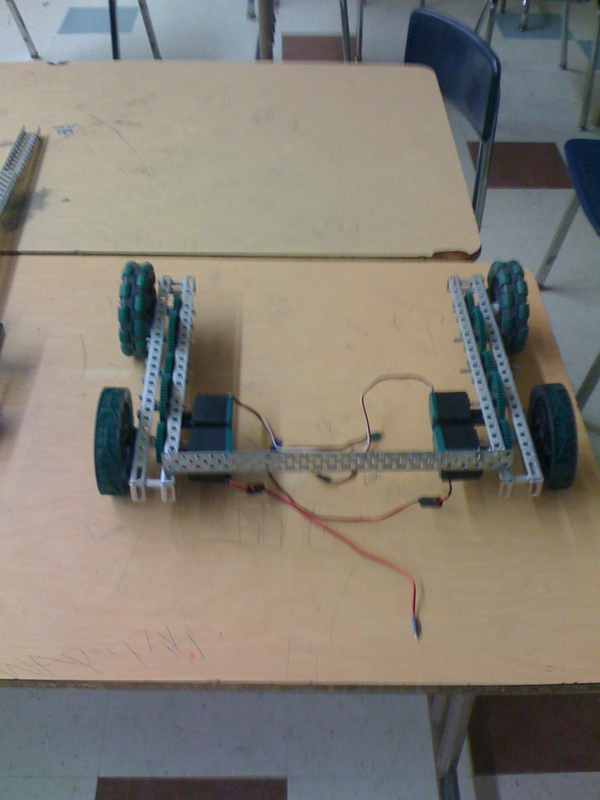 This entry was posted on Tuesday, November 22nd, 2011 at 2:00 pm and is filed under FRC, Vex. You can follow any responses to this entry through the RSS 2.0 feed. You can leave a response, or trackback from your own site.